Sturdy, 1-inch, aluminum A-frame construction provides strength and durability. 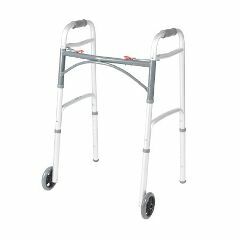 5-inch front wheels and improved rear glide caps allow for walker to slide easily and smoothly over most surfaces. Weight Capacity – 350 lbs.